Valentine candy bouquets of creamy yet decadent chocolate roses fly from display cases! A very popular item especially around February 14th, candy roses make a welcome and affordable sentiment. After all, these delicious treats combine the holiday's two most popular gifts – roses and chocolate. 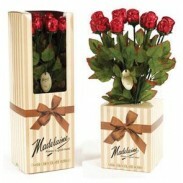 Buy Chocolate Roses Wholesale and Save Big! 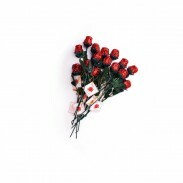 Metro Candy has a large selection of chocolate roses from top manufacturers like Madelaine and Mom ‘n Pops, who have known for decades that flowers and chocolates fly faster than cupid's arrow into a lady's heart. This Valentine's Day, show all the special people in your life how much you love and appreciate them by giving them chocolate roses from Metro Candy. Since you're buying your chocolate roses wholesale, you can afford to give one to everyone on your gift list this year. Metro Candy's entire selection of foil-wrapped chocolate roses is listed below. If you have any questions about our bouquets of chocolate roses or foil-wrapped Valentine's candies, visit our FAQ section or contact us for more information. Our friendly staff will be happy to answer all of your questions.